The sexes of the sacred ibis are alike and overall white in color. The neck and head have bare, black skin. The flight feathers are tipped with irredescent green ending in violet blue. The eyes are brown with an outer rim of crimson. The long, downward-curved bill, feet and toes are black. They are about 20 in. long with long slender legs. The nestling is white with head and back of neck black. The range of the sacred ibis is Sub-Saharan Africa, Madagascar, and the Persian Gulf area. The sacred ibis inhabits lowlands near lakes or near coasts. The eggs of the sacred ibis hatch in about 21 days. This sacred ibis is a wading bird which can also perch in trees. 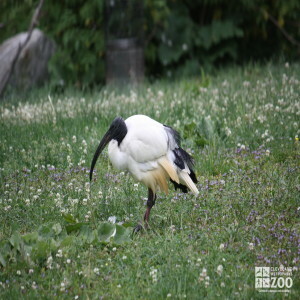 Outside of the breeding season ibis are solitary and silent creatures, but in the breeding season they nest in colonies, often in association with night herons. Flocks fly in V-formations. They use their bills to extract insects from the mud. They have been known to kill baby comorants and scavange dead birds. They thrive on locust infestations. The sacred ibis male chooses the nest site and advertises his readiness by bill pointing and bowing displays. When a female accepts him there is much mutual bowing and display preening. Both birds defend the nest site and incubate the eggs. Local conditions determine the breeding season. The young eat food regurgitated from the parents' throats. Pairs often stay together for more than a year but "exta-marital" pairings are frequent.